NEW YORK -- The highly anticipated art auction season arrived Sunday with a specially curated sale that included a sculpture of a kneeling Hitler by Italian artist Maurizio Cattelan, which fetched a record price for the artist, and a ball suspended in a water tank by Jeff Koons. Christie's "Bound to Fail" themed sale kicked off the weeklong New York auctions of modern, post-war and contemporary art at Christie's and Sotheby's. 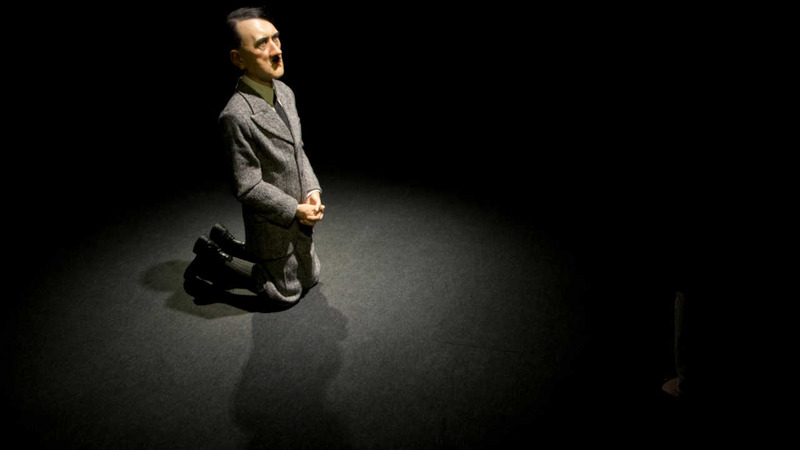 "Him," Cattelan's controversial sculpture of Hitler, appears as a small child kneeling in prayer when approached from the rear. But from the front, the viewer comes face-to-face with the unmistakable likeness of Hitler. It sold for a record $17.2 million. The previous auction record for a work by Cattelan was $7.9 million. The 2001 work, made with human hair, wax and polyester resin, is the artist's proof from an edition of three. It was included in the artist's retrospective at the Guggenheim in 2011. "One Ball Total Equilibrium Tank" is a 1985 sculpture by Koons that depicts a basketball suspended inside a vitrine of distilled water. It garnered just under $15.3 million, beating its $12 million estimate. Both works came up for auction for the first time. The "Bound to Fail" auction features 39 works curated by Loic Gouzer, Christie's deputy chairman of post-war and contemporary art. The concept originated with a work by Bruce Nauman titled "Henry Moore Bound to Fail," a cast of Nauman's own hands bound behind his back. The sculpture sold for just under $7 million. The auction record for the artist is $9.9 million. The themed auction "shines a spotlight on works that have purposefully pushed the envelope of what the art market would be willing to call 'successful' in the pursuit of creating something new and ground-breaking," said Gouzer. In the case of Cattelan, the artist "defied the taboos of representation by disguising evil incarnate under a cloak of innocence," he added. Other works in the sale include a silkscreen by Glenn Ligon of Malcolm X with rouged cheeks and pink lips, which fetched $1 million. Also selling were Marcel Duchamp's lithograph of a masculinized Mona Lisa with a moustache and goatee that brought in $1.2 million, Martin Kippenberger's "Feet First, 1990" depicting a cartoonish frog hanging from a cross that garnered $1.3 million, and Cindy Sherman's "Untitled (#175), 1987," a landscape of decay portrayed with cupcakes that sold for $413,000. Gouzer has curated two other successful auctions at Christie's, including "Looking Forward to the Past" last May where Pablo Picasso's 1955 "Women of Algiers (Version O)" sold for $179 million, setting a world record for artwork at auction. The weeklong spring auctions of 20th century art runs through Friday.